The LV7600 provides everything necessary to monitor SDI and video over IP seamlessly in a hybrid operating environment such as dock10. Leader Instruments recently announced that production house dock10 has added two Leader LV7600 rasterising SDI/IP test instruments to its 4K/UHD and HDR capable grading and finishing areas. dock10 is the UK’s leading television facility where some of the nation’s best loved programmes are made. Its studios and specialist post production services are used to make everything from popular prime time shows to commercials and corporate films for leading brands. "Our clients increasingly need the ability to produce and deliver UHDTV/4K and HDR content," comments Brian Hardman, Head of Broadcast Operations for Post Production at dock10. "We are constantly exploring and testing new technologies that could enhance our post-production capabilities, including the test and measurement aspect. As part of this ongoing process, we were impressed by the company's rapid progress, especially when it comes to HDR." "When I looked at the Leader LV7600 rasterising waveform monitor, I was impressed," says Jamie Parry dock10's Senior Colourist. "The instrument provides all the features I am familiar with on my current test and measurement products. Leader's customisable display and Cinezone HDR real-time false-colour HDR display made working in HDR simple and easy. I don't know how anyone can work in HDR without the Cinezone HDR display. The LV7600 can also monitor SDR and HDR simultaneously, allowing me to check both versions of a production." The LV7600 is a rasterising SDI/IP waveform monitor in a 1U form-factor allowing easy rack-mounted, desk-mounted or desk-top operation. It provides all the facilities needed to monitor UHD/HD/SD SDI as well as video over IP signals seamlessly in a hybrid operating environment. Engineering-related features provided by the LV5600 include test pattern generation, eye pattern display, closed-caption monitoring, CIE colour chart, high dynamic range measurement, focus assist, customisable screen layout, tally interface, 4K/UHD operation, 10G IP input and 12G-SDI interfaces. 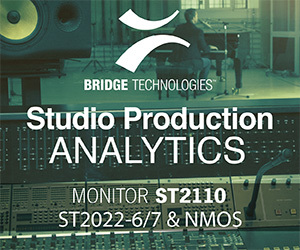 SMPTE 2022-6, SMPTE 2022-7 and the recently published SMPTE 2110 protocols are all supported. The LV7600 also incorporates Leader's Cinezone and Cinelite which are familiar to many content producers.